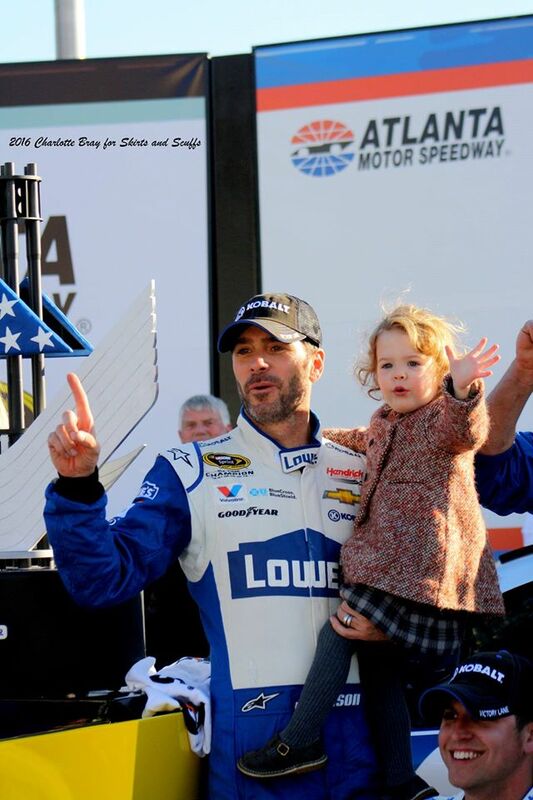 Jimmie Johnson celebrates his 76th career Sprint Cup win at Atlanta, Feb. 28, 2016. The past collided with the present in Atlanta last weekend, as Jimmie Johnson notched his 76th win, tying Dale Sr. for seventh place on the all-time Sprint Cup wins list. Sharing a record with the man he respected, but never had a chance to race, was a sentimental moment for Johnson. Feeling an attachment to someone from the past -- whether it’s Earnhardt Sr. or a loved one from our own family -- can ground us and help us remember what’s important. We’re reminded of the lessons that person taught us and the strong bonds that live on among those who knew him. Johnson recognized the impending link between his own accomplishments and his teammate’s family history. Months before his 76th win, Johnson made a point of connecting with Dale Earnhardt Jr. to acknowledge the approaching milestone and its association with Jr.’s father. Holding up three fingers to show his respect as he cruised the frontstretch, Johnson recognized the man whose record he now shared. Seeing the symbolic gesture most likely tugged at the heartstrings of Earnhardt fans, as his record and Johnson’s merged. In day-to-day life, your past and present can collide when something simple pricks your heart with a bittersweet memory. In fact, it happened to me this morning, over something as mundane as silverware. I ate breakfast with an antique grapefruit spoon that belonged to my grandmother. Sitting in her breakfast nook as a kid, I watched her dig into half a grapefruit with that spoon on many a morning. It’s just an ordinary, not-so-pretty thing with a bamboo handle, but holding it put a lump in my throat. I’d love to go back in time to my grandma’s house, with coffee percolating, poached eggs on the stove and Grandma sitting across from me in her robe and slippers. Looking back on the past can make us sad about whom we’ve lost. I miss Grandma and her sunny outlook on life. She always pointed out the good in a person, whether it was her grandchild, someone from church or a student in her special needs class at school. My grandma showed people the love of Jesus by speaking blessings into their lives. On Sunday, race fans felt nostalgic, too, as they remembered Earnhardt Sr. The record-tying win brought back memories of the man who could intimidate a competitor with a steely glance, yet encourage another with a kind word and a twinkle in his eye. When we remember beloved folks from our past, it’s normal to be sad and to grieve. But we also have two choices about the future. We can dwell on what we’ve lost, or we can acknowledge and revere their contributions to our lives. Johnson followed in Earnhardt Sr.’s footsteps by taking the checkers, and then honored his predecessor with a frontstretch salute. Likewise, I want to honor my grandmother by winning at life the same way she did – by blessing others with kind words. Is there someone from your past you could honor today? Rejoice in the ways that person blessed you, and then pass it on. Meget nyttigt post. Dette er min første gang jeg besøger her. Jeg fandt så mange interessante ting i din blog især dens diskussion. Virkelig sin store artikel. Bliv ved! Hang Award presents thirteen regard's classes for the earth shattering shows of the year in film and TV.